Last Call for Fall 2012 NCIL Policy Interns! You are here: Home / Uncategorized / Last Call for Fall 2012 NCIL Policy Interns! Application Deadline: COB, Monday, September 17, 2012. Please forward this information to your networks and individuals who are attending college, recent graduates, graduate students, or law students. The National Council on Independent Living (NCIL) is filling 2 internship positions at our headquarters in Washington, DC. The NCIL Policy Internship Program is open to students and individuals pursuing a career in a field relevant to NCIL interests, particularly Independent Living and disability advocacy. Although not a requirement, preference shall be given to individuals with disabilities. This program will provide real Washington policy experience to participants at a highly respected national organization. 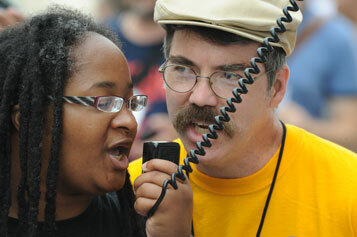 NCIL is the longest-running national cross-disability, grassroots organization run by and for people with disabilities. Founded in 1982, NCIL represents thousands of organizations and individuals including: Centers for Independent Living (CILs), Statewide Independent Living Councils (SILCs), individuals with disabilities, and other organizations that advocate for the human and civil rights of people with disabilities throughout the United States. The program includes 2 internships, with positions lasting from Mid-September until Mid-December. Interns are required to work 10-15 hours each week based out of NCIL headquarters in Washington, DC; actual schedule and hours to be negotiated with the Executive Director. Although internships are unpaid, NCIL will cover the cost of all job-related travel to meetings, and assist interns with post-graduation job placement at related organizations. NCIL will also assist students seeking academic credit if the opportunity exists at their school. Successful candidates completing the internship program will gain valuable policy experience in Washington, and will be ideal candidates for open positions at NCIL, CILs, and other advocacy organizations across the country. To Apply: Please email a cover letter, resume, and letter of recommendation to Austin Walker at austin@ncil.org.